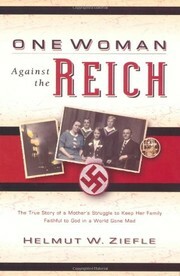 2 editions of One Woman Against the Reich found in the catalog. Add another edition? Are you sure you want to remove One Woman Against the Reich from your list? Published May 25, 2004 by Kregel Publications in Grand Rapids, Michigan, USA . World War II Germany. It was a desperate and dangerous place where evil had bullied its way into power and controlled the daily lives of almost every individual. But not all. One Woman Against the Reich chronicles the true story of Maria Ziefle's struggle to raise her children free from the hate-filled grip of the Nazi regime. It is a powerful portrayal of the courage and determination of a Christian parent to remain obedient to God in spite of the enticements and assaults of a hostile culture. March 2, 2017 Edited by Todays Martyrs Reviewer Edited without comment. August 29, 2016 Edited by Todays Martyrs Reviewer Edited without comment. August 29, 2016 Created by Todays Martyrs Reviewer Added new book.